Dust is an artist’s enemy. It can gather on top of acrylic, obscuring your art. And when work is unprotected, it can stick to drying paint, damage paper, and generally ruin the effect you’ve worked hard to create. Pastels, chalk, charcoal, and graphite generate their own dust which can fall from the paper, affecting the framing treatment and the overall look of the piece itself. Some artists use fixative sprays to combat it, but others avoid them, as they could alter the appearance of the work. 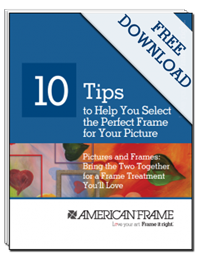 Luckily, there are several framing treatments you can use to work with ꟷ instead of against ꟷ the dust. Creating a space for it to gather keeps the dust off the artwork, mat board, and acrylic, reducing the risk of a blurry effect. American Frame Customer Engagement Representative Helen Holman shares some methods of doing this below. Some artists use an extra mat board with narrower borders behind their primary mat board. This creates a space where dust can fall and settle. You can also use EconoSpace spacers to create a gap between the mat board and the artwork. Place the sticky side of the spacer on the back side of the mat board. This lets the dust settle in the reservoir created by the spacer. Strips of mounting board can also be used to create this dust reservoir. Strips of mounting board are a great option for framers on a budget, as they are inexpensive. Some artists use a reverse bevel to let dust fall behind the mat instead of resting on the bevel cut. Do you have your own ways of combating dust on your work? Share them with us. Tweet at us at @AmericanFrame, or email us. Dust is the enemy of an artist. It obscures your art. Good tips. Dust is so hard to deal with.